Hello again and welcome back! This year has started off with a series of blog posts featuring things I have wanted to learn but for one reason or another procrastinated. This post focuses on curing and cold smoking, two areas covered in a great book named Charcuterie The Craft of Salting, Smoking, and Curing . For this cook I cured, then cold smoked a beautiful piece of farm raised salmon. 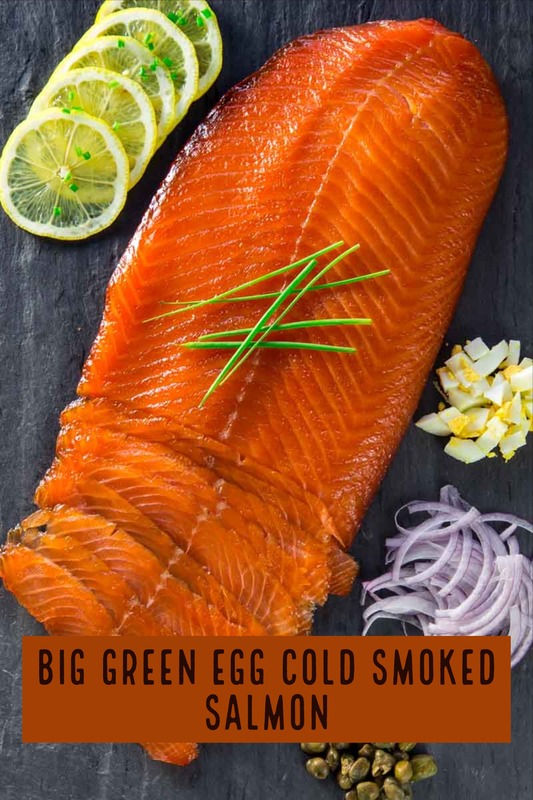 Now sit back, grab a nice glass of Sauvignon Blanc, and enjoy this post for Big Green Egg Cold Smoked Salmon. Although there are a lot of moving parts to this recipe the cure used for the salmon was simple featuring just two ingredients: Coarse Salt & Brown Sugar. Mix the salt and brown sugar well and place a layer on the bottom of a pan before laying the salmon on top. Then cover the salmon with the remainder of the salt, sugar mixture. I moved the cured salmon to a deeper dish since the cure creates a brine when pulling the moisture from the fish. Here is the salmon after 36 hours in the cure. After 24-48 hours, rinse the salmon under cold then place it in a bowl of cold water for 30 minutes to extract the salt. Pull the salmon out of the water and place on a wire rack, then refrigerate (uncovered) overnight. This helps dry the salmon creating a surface the smoke will adhere to. After the salmon sits overnight in the fridge it is time to set up your Big Green Egg for the cold smoke. I used the Amazen Pellet Smoker with Apple Wood pellets . Fill the maze with the pellets. Clean out all of the lump charcoal in your Big Green Egg so the fire box is empty. To light the pellet smoker, place on top of your grate, light the corner of the smoker with a butane torch, and let the flame burn for 10 minutes. After 10 minutes, blow out the flame, and place the pellet smoker in the bottom of your fire box (mine sits on top of my Kick Ash Basket below). Keep the top and bottom vents all the way open and let the smoke billow from the Big Green Egg. Place your ConvEGGerator legs up and then the grill grate on top to complete your set up. Remember this is a COLD SMOKE so if you are doing this in weather above 70° Fahrenheit you need to add a tray of ice to your environment to keep temp under 90°. Fortunately, this cook was in February and it was 32° outside. Once the pellet smoker has been producing smoke for another 10 minutes place your salmon inside on top of a wire rack on the grill grate. Close the dome and let the salmon smoke away for 6 to 12 hours. For this cook, the salmon was ready at the 8 hour mark. As you can see the smoke was still going strong with this little pellet smoker! Pull the smoked salmon from the Big Green Egg and place it on a large piece of butcher paper. Wrap and place in the refrigerator overnight before slicing and serving. Serve with lemon, chopped hard-boiled egg, sliced red onion, capers, cream cheese, and fresh bagels. This was an amazing experience and one I look forward to doing again soon trying various aromatics for the salmon cure. Have you ever wanted to cure and cold smoke salmon? If so, this recipe will walk you through it and teach you all the in's and out's. Combine the salt and brown sugar in a mixing bowl and mix well. Spread ⅓ of the cure over the bottom of a glass baking dish large enough to hold the fish. Lay the salmon on top of the cure. Spread the remaining cure on top of the salmon to cover the fish completely. Cover the dish with plastic wrap and cure the fish in your refrigerator for 24 to 48 hours. After 24-48 hours in the cure rinse the cure off the salmon under cold running water. Place the salmon in a large bowl and cover with cold water. Soak for 30 minutes, then drain well. Blot the salmon dry on both sides with paper towels. Lay the salmon on a wire rack over a sheet pan and let the salmon dry, uncovered, in the refrigerator over night. Fill your Amazen Pellet Smoker with Apple Wood pellets and light in one corner. Let the flame burn 10 minutes before blowing it out to produce the smoke. Empty out your fire box and place the Amazen Pellet smoker inside. Put the ConvEGGerator in the Big Green Egg for indirect cooking. Place the salmon on a wire rack in the Big Green Egg on top of the grill grate. Now cold smoke the salmon 6-12 hours. You will know when it is ready when it takes on that semi-firm and leathery look. Wrap the salmon in butcher paper and let it rest in the refrigerator overnight. Slice using a sharp knife diagonal to the fish, cut the salmon into paper-thin slices. This post is filled with little nuggets of cool technique. Thanks! Nevertheless still super tasty, just wondering if anyone had the same experience or has any ideas? James you are exactly right. The change in outside temp impacted the cold smoke. Next time try the ice as that should offset the outside environment. Going to give your recipe a go this weekend. Thanks for the well described process; it will be my first cold smoke. Do you think outside temps around the freezing mark and just below will be a problem or affect the results? My setup is the same as yours. Thanks for reaching out. My assumption is it will not impact your cold smoke. If anything it should help. Interested in the results… please report back!